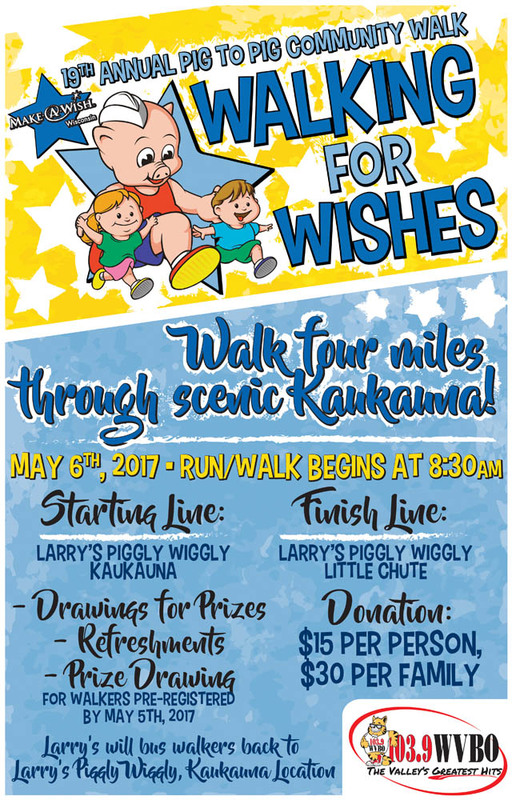 KAUKAUNA — Sign up is now open for the 19th annual Larry’s Piggly Wiggly Pig-to-Pig Walking for Wishes walk to benefit Make-A-Wish Foundation of Wisconsin. This year’s event begins at 8:30 a.m., Saturday, May 6, 2017, at the Kaukauna store, located at 300 East Ann Street. The annual event attracts hundreds of walkers and runners who travel four scenic miles to the finish at the Piggly Wiggly in Little Chute. Join a colorful cast of characters for this fun walk and enjoy food, refreshments and prizes all while helping to make wishes come true for local children battling life-threatening medical conditions! Plus, every registered participant will receive a free T-shirt. To participate, sign up at any Larry’s Piggly Wiggly or download a signup form HERE. Participants will get a bus ride back, courtesy of Kobussen bus, to the Kaukauna store following the event. The suggested donation is $15 per person or $30 per family. See photos of last year’s event HERE. Over the past 18 years, Piggly Wiggly and its team members have raised nearly $365,000 to help make more than 70 wishes come true for Wisconsin children battling life-threatening medical conditions.